“Elementary, my dear Watson!” Everyone has heard this, and most Sherlockians know the phrase was never spoken by the Master in The Canon. Holmes did describe things as “elementary” a number of times, and addressed Watson as “my dear Watson” frequently, but the terms were never combined the way popular culture would have us believe. Was this really a Holmes original, or did he pick it up somewhere else? I think it sounds Biblical, but I do not know the context. After all, the editions of the Holy Writ are so numerous . . . Here is the same phrase used in a May 27, 1918 newspaper article from New York Times, quoting a British General regarding the outcome of a WWI military operation. 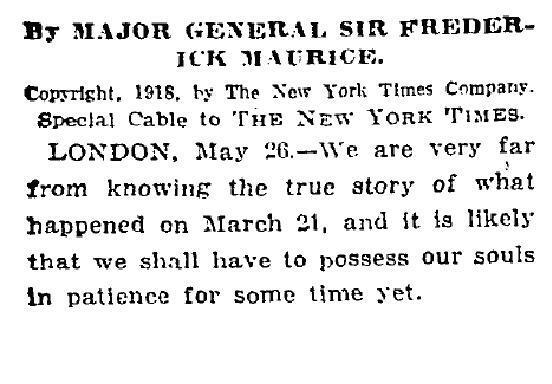 Maybe General Maurice was a Sherlockian, too! Friday evening, the Agra Treasurers of Dayton hosted a reception. Revolvers and Handcuffs made of Chocolate were the order of the day! That evening it was announced next year’s symposium would be held May 15-17 instead of the customary March date in hopes the weather would be more cooperative–which was met with enthusiasm. A total of 35 people attended the symposium in spite of the 12+ inches of snow and Level 3 driving alerts in the area (that means stay off the roads). Many of the members of the Indianapolis, Columbus and Cincinnati areas were not able to attend because of the weather (like OUR first meeting). A total of 7 presentations were made including one by our member, Regina Stinson, BSI. Her topic–The Moving Sherlock/A Study in Film–dealt with the many actors over the years that have played Sherlock Holmes. The presentation included several film clips to complement and illustrate the points of her text. Several vendors also attended and a combination of books, photographs, videos, knitted items and unique Bric-a-brac were available. The evening closed with a cocktail hour, buffet dinner and a Sherlockian “Brain Buster” quiz. Normally the quiz would have been held Sunday morning but was moved forward due to the weather. This gave everyone the opportunity to get an earlier start home–or at least a decent start time since we lost 1 hour with the change to Daylight Savings Time. Thanks to Cathy Gill for organizing the symposium and to the Agra Treasurers for hosting Friday’s reception.